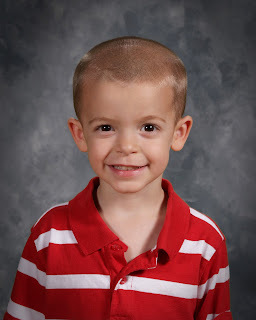 Sean had his first school picture recently... it was so fun to have him help pick out what he wanted to wear and remind him to "show a great smile"! Fortunately, we don't have to worry about the bad hair day (helps when you have no hair). I was pleasantly surprised at how great they turned out! And I am NOT just saying that cause I'm the Mom. I think his school picture is FANTASTIC!